Christmas in Cape Town is a sizzling time of year, when the city comes alive. If you’re dreaming of festive parties at the ocean-side, treat your family to a holiday in a prestigious self-catering villa. 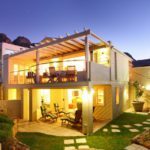 With the right holiday home, you can enjoy a Christmas Day celebration with extra pizzazz in the beautiful Mother City. 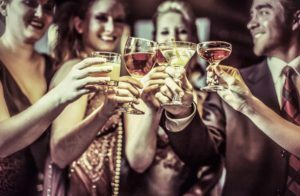 Great parties begin with the right location, and you don’t get any better than these! If you’ve got big plans for entertaining friends and family over Christmas in Cape Town – why not host a stylish soirée your guests won’t forget in a hurry? Each of these deluxe villas boasts a few bonus features, making them a real prize for tourists visiting the city. Here, you can enjoy Christmas activities like sunset swims, seafood braais and chilled cocktails while you take in the good life during your stay. Each of these festive villas has a few extra-special features that will add glamour to your Christmas Day celebration or New Year’s party. You will love the fully stocked wine cellars, luxury hot tubs, private cinemas and decks that go on for miles. 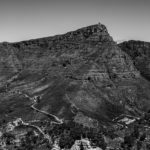 So, what happens on Christmas in Cape Town? When you stay in one of these opulent villas, the only limit to the festivities will be your imagination! And that’s exactly what you need, to plan a party. About the villa: This gorgeous private home sleeps 12 lucky guests with refined tastes. 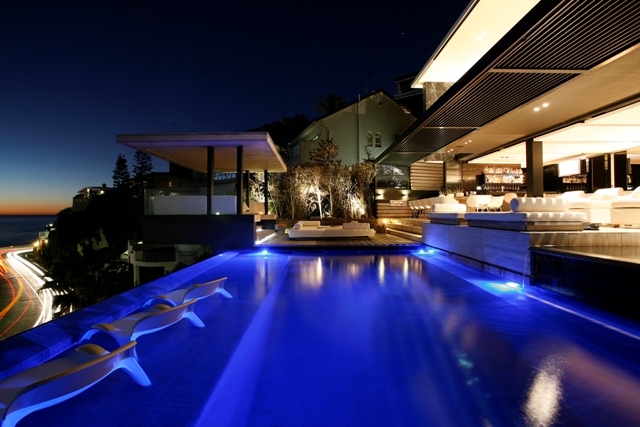 The property has 7 lavish bedrooms and plenty of party-friendly entertainment areas. So why not throw a fully staffed pool party? Sense of Peace has a cinema room and a gym, and has a variety of exclusive services to enhance your Christmas in Cape Town. You’ll have access to your own butler, chef and driver –with bodyguards and multi-lingual tour guides at your disposal. Festive features: This grand villa includes a 22m L-shaped swimming pool, Jacuzzi and outdoor shower. After your bat hop on the promenade, put on some great music and let your guests enjoy the pool deck for the rest of the day. About the villa: This 6 storey modernist mansion lends itself to an upmarket midsummer party at dusk. The interior has designer furniture and water features sheltered by 6m high ceilings – this is a venue that will impress the most discerning of guests. It looks even better as the sun is going down! New Wonders is a 7 bedroom villa that accommodates 10, although the entertainment facilities can cater for larger groups. 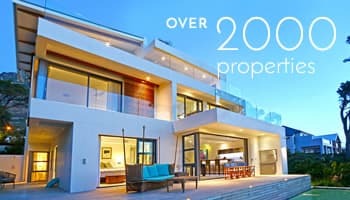 It’s also close to the beaches and nightspots of Clifton and Camps Bay. Christmas in Cape Town wouldn’t be the same without a casual cocktail party at sundown, with your favourite canapés, a selection of wines from the private cellar and networking at the pool. Top holiday features: At New Wonders villa, you’ll find a heated rim-flow pool, a private cinema and a wine cellar. From summer night splashes, to sun downers or intimate movie nights, the good times will just keep on rolling. Who could ask for a better party venue for the holidays? About the villa: Wood Mansion is the spot to host a sophisticated festive get-together. It’s set in a secluded amphitheatre of mountains, providing a tranquil setting for an opulent dinner party. Every detail of Wood Mansion has been meticulously combined to offer you a supreme vacation experience. Think handcrafted wooden floors and furnishings, in a picturesque mountainside holiday home. What a delightful place to enjoy your Christmas in Cape Town. Wood Mansion includes 4 double en-suite bedrooms, and accommodates 8 guests. Amenities also include a swimming pool, cinema and Jacuzzi. Bonus features: The manor has glass corridors and outdoor living spaces, where you can make the most of the panoramic Hout Bay views. Each suite has a private outdoor shower, perfect for summer mornings after your run on the beach. At Wood Mansion, gourmet meals like prawn and lobster barbeques can be arranged for an additional fee. 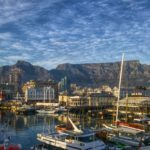 Try Christmas in Cape Town with a seafood spin for dinner! Local food bloggers have a few stellar recommendations for spots to enjoy a festive lunch on the day itself. Our favourites on the list are lunch at Spier Wine Farm and the buffet at Grande Roche. About the villa: The final property on our list is the last word in sophistication. This holiday home has 4 spacious en-suite bedrooms, and sleeps 8. It’s found on Clifton’s prestigious Nettleton Road, just moments from the beach. The location is one of the best things about this villa because it means parties on the beach! Did you know that Nettleton Road is the priciest South African street to live on? 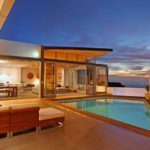 According to Times Live, properties on Nettleton are at the top of the luxury market, as the most expensive in the country. Top features: Party here, and you’ll enjoy a fully equipped home gym and steam room, so you can work on your beach-body before you strut your stuff on the Clifton sands. While most of us tend to indulge over Christmas, in Cape Town it’s all about seeing and being seen! If you’re looking to take things easy – skip the gym and enjoy a movie in the private cinema, with a glass of wine from the well-stocked cellar. These holiday mansions are designed to make your party plans ultra-special. Each one has some truly enviable asset, making it easy to spoil yourself and your guests this season. Whether it’s a pool party, cocktails at sundown, a dinner feast or a beach bonanza – this is where the party begins. Have these drop-dead-gorgeous villas inspired you to spend Christmas in Cape Town? Be the first to snap up one of our luxury holiday homes for peak season. 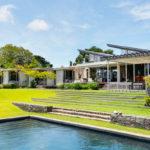 Browse for more Cape Town luxury holiday villas here. A love and a keen eye for Architecture, Interior Design and Interior Decorating drew Caitlin Howie to the Villa rental industry, where she now consults and sources the perfect holiday property to match her specific clients needs. Both in the office and out on viewings, Caitlin inspires elegance and offers a fresh breath of air to the Capsol team. Her other passions include being a mommy to a curly haired blue eyed “angelic” 1 year old boy, and… any mother will know that that’s normally all there is time for.